Giving a card to friends or family who are celebrating an anniversary is one of the most common and integral ways of getting involved in the celebrations. To mark the tremendous achievement that is reaching a milestone wedding anniversary, you’ll want to write something in the card, or on the gift you have carefully selected that is heartfelt and precious. It can be tricky knowing what to write in cards, as a simple greeting sometimes does not do the occasion justice. You want your message to be memorable to the recipients, and you don’t want to fall into the trap of writing the same thing as everyone else who will be giving gifts and cards. At Flowercard, we know that you’ll be wanting to create a message that shows you sincerely care. An abundance of poems, quotes and messages on the internet can help you decide what to write in your card, however, trawling through them all can be an enormous task in itself, that’s why we’ve rounded up our favourites, to pass onto you, to help give your gift that extra special finishing touch. What to Write in Silver Wedding Anniversary Cards? Silver wedding anniversaries are celebrated after 25 years together. It is from the 25th wedding anniversary that the tradition of giving gifts is said to have originated, it was Roman tradition for a husband to give his wife a silver crown on their 25th wedding anniversary. What to Write in Golden Wedding Anniversary Cards? A couple celebrates their Golden wedding anniversary after 50 years together. “It’s your golden wedding anniversary, and it makes me so happy to say: Through the years I’ve gotten to know you well, and I’m proud to applaud you today. Now your union is golden; its 50 years, an accomplishment hard to achieve; I hope you will flourish as more years go by, and whatever you want, you receive." What to Write in Diamond Wedding Anniversary Cards? A diamond anniversary marks an incredible 60 years of marriage – the date is so rare and remarkable that couples receive a message from the Queen on their 60th wedding anniversary. You may not be the Queen, but you can make sure that you have a message that express the same sentiments with one of the quotes or poems we’ve selected. That can be seen from every view. Sixty years of giving happiness, love and loyalty to each other must not go unmarked. You don’t have to be restricted by putting quotes or poems into a card, you could have them printed to put in a nice frame, for a gift that will also stand the test of time. Finding the right poem or quote needn’t take up much time, after all, a loving and genuine message means more than finding perfect literature. If you do decide to go with a pre-written piece, try and tailor your message for the couple in question. There are more humorous quotes that take a far less serious tone that can be found with a simple Google search. If the couple that you are celebrating with are religiously inclined, then you can find verses from the bible regarding relationships, love and commitment. Quotes can be found relating to relationships from all religions and belief systems, after all, millions of people look to religion for advice on relationships all over the world. Quotes, guidance or poems about love might be cherished by spiritual couples as a nice alternative to a religious message. A milestone anniversary can be a difficult time for those who may had sadly lost a partner who they were together many years or even decades, and the date that would have been a milestone anniversary will be a hard day for all those involved. There are messages to write in sympathy cards that are sensitive and express condolences for the day. 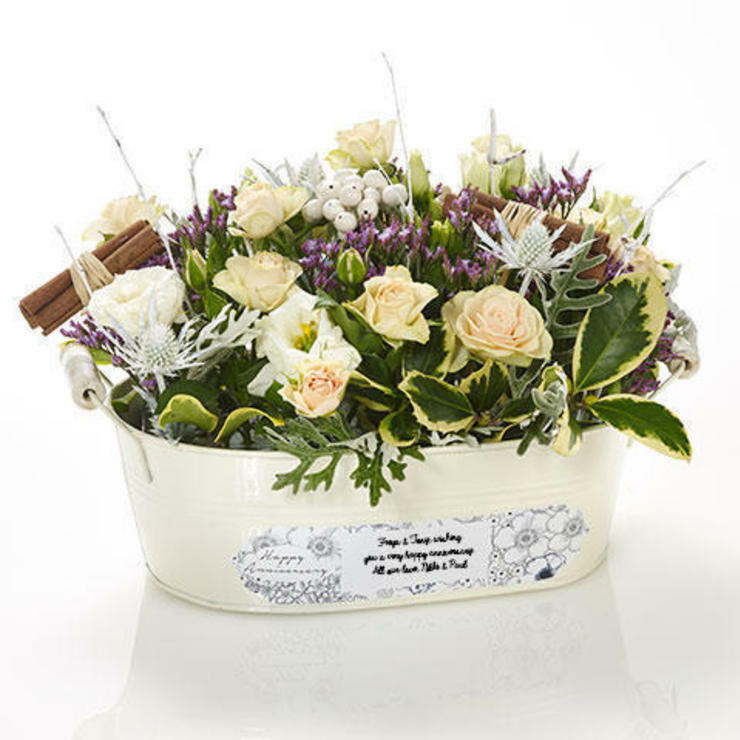 A traditional sympathy message will probably suffice, and can be personalised for the occasion and recipient. We hope you’ve found the inspiration you need to be able to craft the perfect message for your card or gift. If you’re still looking for messages or gifts that will inspire, then Flowercard stock a range of meaningful flowers and cards that any recipient will cherish.